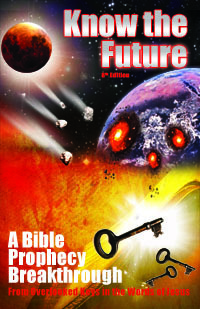 Bill Salus is yet another prophecy teacher and author in the "pretrib rapture" camp. This is unfortunate since he is one of the few who have come at last to see Psalm 83 as an unfulfilled prophecy. Yet he bears the same fatal flaw that every other prophecy teacher I have examined does: he does not present a comprehensive eschatology that is based on the Book of Revelation's unique chronological framework (with all other prophecies like Psalm 83 hung off that). Without putting first things first, it is no surprise that we have all the conflicting and confusing theories on prophecy that we have today, instead solid answers. But there is always hope he may correct his errors: Bill describes himself as "the up and coming talent, whose author styling appeals to scholars and laymen alike". I do not care about style as much as I do completeness and accuracy. I hope he keeps at it and lives up to his self-billing.